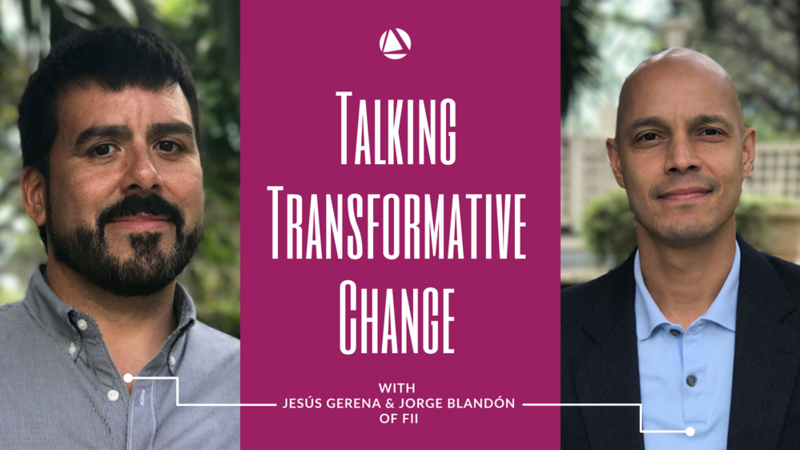 We caught up with the Family Independence Initiative’s (FII) CEO Jesús Gerena and EVP Jorge Blandón to talk about the state of FII and their vision for the future. FII, a breakthrough organization that invests directly in low-income families across the nation, has been a New Profit grantee-partner since 2010. FII provides low-income families a technology platform to strengthen social networks, access resources, and support one another in achieving mobility, helping them work individually and collectively to achieve prosperity. Q: What is the big, transformative vision behind FII? Jesús: We are changing the way that low-income families and communities are seen and invested in. We know that today there are systemic barriers that challenge low-income families’ ability to leverage their assets, strengths, and capacities. Our vision is centered around removing those barriers and doing away with top-down approaches to fighting poverty by creating an environment in which families are the change agents and communities are collectively solving the problems that keep them from leading more economically secure lives. We are recreating the conditions that allow low-income communities to come together and help each other escape poverty. Early immigrant communities, such as the Italian and Polish communities, capitalized on each other’s networks, skills, and strengths and were able to lift up the entire community. It is critical to build a strong narrative in response to all of the negative stereotypes about low-income families, and to change perceptions by working with those same communities and families to put the truth out about their hard work, resourcefulness, and initiative. Jorge: We are working to create a new system altogether that's driven by families and leverages technology to challenge stereotypes, position families as decision-makers, and ultimately put investments directly into the hands of families. Technology has, in the last few years, really allowed us to accelerate the pace at which we can explore and augment lessons learned. Through UpTogether, FII’s community building platform, we are learning from FII families about the cycle of poverty in our society. The data we are collecting in partnership with families allows us to have far-reaching impact by sharing lessons learned. This information shifts Americans’ perception of low-income communities and starts to drive dollars into these communities as a result. We can also use the analytics to measure the impact that those dollars invested directly into communities have. Q: What is the innovation behind your core technology platform and how is it tailored to the needs of FII families? Jorge: FII’s online community building platform, UpTogether, is where families discover each other’s expertise, find support from others in the community, and access funding from FII. The technology platform allows families to connect, and it allows FII to track the progress of individual families and use the data to identify and invest in the solutions that are working for them. We haven't created any new technology, but the way that we're using and leveraging technology is different. We have taken elements from tools such as Facebook, Craigslist, LinkedIn and Mint and put them on one secure technology platform designed to allow families to build their own community while protecting their privacy. The foundation of our technology platform is trust, and when you have trust it allows families to share. That helps our organization to learn and, more importantly, creates value back to those participating in it. The value that is created takes the form of strengthening community and of seeing your own information reflected back to you. You know how your data is being used because you see it reflected in charts and reports on our platform. The more families share, the more we learn, and the more we learn, the better we are at injecting capital into the initiatives that low-families are leading in their communities. Jesús: I would highlight that the families are the center, and they are really helping us through their user experience to evolve UpTogether and shape the culture of a new system that invests directly in families. With this approach, the families are the experts and our staff act only as the story-gatherers, connectors, and advocates for the FII model alongside thousands of family partners. Q: What are some of the key trends you are seeing in the data you are collecting? Jorge: UpTogether facilitates connection between people locally and nationally to support one another’s goals, share information, and form new relationships. The most unique trend the UpTogether platform reveals, measures, and quantifies is the exchange in social capital. We ask people, did you offer babysitting to your neighbor? Did your neighbor come up and cook for you because you were sick? Did you give a ride to a friend to work because their car broke down? The answer is yes for most of our families, and we have assigned a value to it to demonstrate the true capacity and resourcefulness already underway between people. So far, we have tracked over $6,066,515 that FII families have exchanged. Just last year, over three million dollars in social capital activities that were reported by FII families. One area where families have a great deal of initiative and engagement is around their children and their children’s education. We are seeing trends around families getting together with their neighbors and really connecting on a deeper level—and not only connecting, but also supporting each other to help their children. Q: How are you using what you are learning from the data now to inform FII’s future work? Jesús: A big piece of it is determining how we put the data in the hands of families so that, if they choose to, they can activate their household and their community around issues they care about. How can we put this information in their hands so that they continue to be at the center and be the drivers of their own destiny? I think for us it forces the organization to start thinking differently in terms of how to use the data because at the end of the day, we want the families to be the ones advocating for what they want. We will support them, but it can't be FII driving the priorities—it has to be the families. Families are the stewards of their own destiny. It forces us to imagine a different approach to empower communities with their own information. An example of how we’re working to achieve this is the Initiative Score, which is an alternative to the traditional metrics that families are evaluated by when trying to gain access to working capital, such as credit scores. We collect over 400 data points from FII families on our platform, ranging from typical indicators such as income and assets to nontraditional indicators such as what progress they are making toward goals, how they are helping their neighbors, and how their kids are doing in school. By pulling data from indicators of family well-being (financial, social capital, health, and youth and family), we are able to capture the hustle and strength of low-income communities and make those data points accessible to those who make decisions about resource allocation (to learn more, check out FII's blog post Initiative Score: Painting a More Accurate Picture). We have already signed a partnership with a lending institution willing to utilize the Initiative Score in distributing capital to families through our platform, and we hope it becomes widely available in the coming years so that more families gain access to capital. Q: How would you explain this moment in time in terms of FII's evolution? Jesús: We are in a period of growth. We are working with over 3,600 households across the country in twelve cities across nine states, and we plan to add Illinois and Texas to our network this Fall. We have five partnerships in four of those cities. We are also undergoing a strategic refresh, and we have also been building our capacity and infrastructure, including building out our technology and data team. Jorge: When we think of growth, we don't think of it in a traditional sense in terms of trying to scale an organization. For us, the growth means engaging as many families as we can, and we know the result is family networks. This focus on supporting relationships in a place and across the country creates long-term relationships between people and supports community resiliency. Our role is to learn from different communities and families in order to help more people understand the truth about what is helpful and hindering in the systems that exist today. Our data shows that communities have initiative, and we want to see that information influence how programs, policies, and investments are made. Q: What are the lessons you are learning about leadership transitions at organizations like FII whose founder has been so closely tied to the vision and work of the organization? Jesús: What I would say is it takes time. It takes a lot of trust and strong relationships to be able to support a leadership transition. We have had to focus on all of the key elements that go into building healthy relationships across our organization and our community of FII families: transparency, communication, and building on each other’s strengths. I think that has been important as I have moved into the CEO role after Mauricio Lim Miller, FII’s founder, retired and moved onto our Board of Directors. Jorge: Part of it is really living our values as an organization, and our core values is putting full trust in families. We live that value and we trust each other as well. Trust is a precious commodity; it's not free. You have to earn and protect that trust, and you have to reciprocate—it's a two way street. Q: What do you see as being the biggest barrier to achieving FII’s intended impact that you are facing right now? Jesús: We have been doing this work for seventeen years and I have found opportunities to continuously introduce the notion that we're underestimating and underinvesting in a group of people who have the capacity, the will, the creativity, and ingenuity to succeed. Overwhelmingly, people are skeptical because there is an ingrained narrative that people in poverty are not able to figure these things out for themselves. I think that we could be and should be so much further along in understanding that directly investing in low-income families is not threatening the current social sector, it is improving it. 75% of families move above the federal poverty line within four years; but, 50% slip back under within five years. We need policies that focus on supporting this critical group of families who have just come out of poverty to help them get more stably into the middle class. The idea that it takes only $2,400 to $3,200 of investment over two years for a FII family to get there is remarkable. The total economic impact after two years in FII is, on average, $15,180, with families seeing on average a 22% increase in monthly income, $1959 increase in liquid assets, and $1,039 increase in savings in Retirement Investment Accounts. But the secret sauce behind those numbers is the platform that enables families to individually and collectively support one other on making progress towards goals focused on escaping and staying out of poverty. This community-based approach to poverty alleviation is effective but is challenging to execute and scale in a society that values individualism over the collective. Jorge: Folks also have a hard time reconciling that we are both family-centered and technology-driven. It is hard for people to make that leap because they think of nonprofits as providing services in more a traditional way that is not centered on the use of technology. Our approach is both deeply community-focused and technology-based. Rather than providing social services, we create an environment in our online platform where families set their own goals and trust their peers to support them on their journey. Part of the challenge is also for people to let go of the idea that those of us working in the nonprofit sector have all of the answers. I come from finance, but now I have the best job in the world because I don't have to come up with solutions. I am freed of that burden because the solutions already exist in communities and it's just my job to find them. So it’s a very different dynamic. I think it’s human nature that we want to come up with the solutions, to be at the center of those solutions. What I've found is that the more I've let go of that concept, the more I get back. It is hard for people to let go and make that mental switch. Q: How do you keep joy in your work? Jesús: We have incredible people who work at FII that live our values and have the energy, the commitment, and the humor to fuel our work. So that makes it pretty easy to keep joy day to day. Jorge: For me, a big piece of it is recognizing my family’s journey and every day reflecting on that journey. I reflect on how hard my parents worked and how hard the parents we're engaging with are working, and there is a sense of pride that comes from just recognizing that. I get to tell their stories, and I get to show how strong and innovative they are. That's exciting work. Check out FII’s 2017 annual report—UpTogether—that celebrates the results of a breakthrough year for FII and the families they support. Baakir Tyehimba (FII New Orleans Fellow) standing outside his business, BlackStar Books & Caffe “Welcome Black Home” in the Whitney/Algiers area of New Orleans. Michelle applied and received the FII Bertha Miller Scholarship to finance her daughter's college education. Khalima is currently a freshman at Framingham State. Center (blazer on) Kevin Canada (Gloria's oldest son). Marquize Prince (younger son), Aiesha West (light blue shirt on), Mariela Hilton (white and orange shirt), and Gloria West (all the way to the right with yellow shirt). Gloria West applied and received an FII scholarship to pursue a Bachelor's in Human Resources, which she later merged to get an MBA. From left to right - Cesar Cano (husband), Valeria Cano, Isabella Cano, and Natalie Cano. Natalie purchased her first home using an Individual Development Account that matched their savings two to one. Teens that will be participating in the social club that Aisha Porcher (FII Boston Fellow) is starting. This social club fosters a space for teens to meet in the same way that FII families meet on a monthly basis.